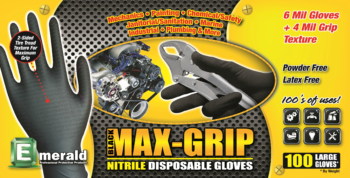 The Emerald Black Max-Grip powder-free nitrile glove offers an innovative design giving tenacious grip with superior tactile feel. This latex-free 6 mil disposable glove has a beaded cuff and a 4 mil textured ridge to channel fluids away when gripping wet surfaces. The black color conceals surface agents, allowing for longer use. Perfect for mechanics or anyone needing protection and security handling slick equipment. 100 gloves per dispenser box (90 XXL), 10 boxes per case. The FD&C Act are laws passed by Congress giving authority to the U.S. Food and Drug Administration (FDA) to oversee the safety of food, drugs, and cosmetics. 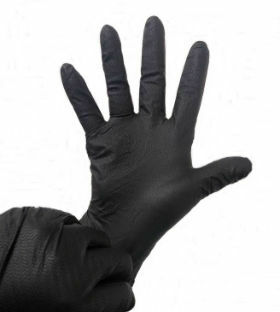 All Emerald Professional glove components are in compliance with provisions of the FD&C Act, which allow repeated use in direct contact with food.